The sun beat down in the unrelenting stream of 110 degree heat of Africa in November. Unhindered by the extreme conditions, Gideons diligently piled boxes of Scriptures into cars, anxious to begin the 2014 Ghana International Scripture Blitz. 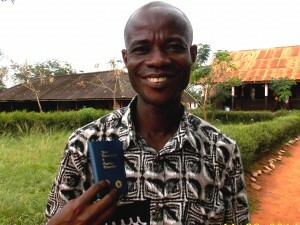 With a population of over 27 million people, Ghana holds over 75 ethnic groups speaking over 100 languages. The opportunity to reach out and touch the life of a non-believer in Ghana is great. This November, a team of 21 international Gideons traveled to the cities of Accra and Kumasi for the 2014 Ghana International Scripture Blitz. On the first day of distributions, team members met up with local Gideons to place Bibles in hotels. The manager of the Allisa Hotel was thrilled to receive the Bibles in his hotel rooms. He told Gideons he had a guest check out and demand a refund because there was not a Bible in the room. The manager began looking for a way to provide Scriptures, and shortly after, the Gideons showed up. He was amazed Gideons provided Bibles at no cost to hotel managers. A full day of hotel distributions resulted in 12 personal salvation experiences and 19,570 Scriptures placed. The same day I met the Gideons, I had just purchased a new car. On the way home, I was pulled over by local police. After a search of the new car, police found small amounts of marijuana and asked me who it belonged to. I explained it was a new car and the seller must have left it in the car. The officer noticed the blue New Testament in my pocket and said, “Bibles and drugs don’t go together. I believe you.” He let me go! Driving home, I realized it was God’s Word that saved me that day, and that God would save me every day if I would give my life fully to Him. So I did. While visiting Nsawam National Prison, the largest prison in Ghana with 3,600 inmates, Gideons attended a worship service with approximately 300 inmates. The Spirit of God was truly present as inmates lifted their hands, clapped, and sang along with the worship leader. After Gideons presented a message and shared the plan of salvation, 60 men came forward to dedicate their lives to Christ. By the end of the week, the original Scripture distribution goal of 450,000 was far exceeded and over 575,000 Scriptures were distributed. To God be all glory! I am thrilled by this wonderful distribution and the stories that are coming in afterwards. I actually thought that the Blitz would be cancelled, but we have seen what the Lord had in mind for the wonderful people of Accra and Kumasi. Praise the Lord; His way are higher than our ways! YES!!!! To God be the glory, great things He has done, does do and HE WILL CONTINUE TO until He comes again!!! Amen!! and thank you Gideons for being a part of His instruments to bring His Word to the nations of the world!! Thank the Lord for faithful men, who in the face of adversity, stood in their places in Ghana. God is still reaching lost souls through HIS Word – The faithful Gideons still have work to do! Hallelujah – Praise HIS Name. Amen to God be all glory! Thanks Ghana Team. I love the stories of ordinary people who’s lives are transformed by our wonderful Saviour and God! Especially the one about the driver who had just bought a car, the same day he received a new testament. He was stopped by the police. They a little marijuana! Read how the N.T. in the driver’s pocket saved him getting arrested! The good Lord bless you all for the great work u are doing. I am currently a student of university of Ghana and will be ever ready in the propagation of the word of God.